There it is, in all its glory, my complete Metro Rings. 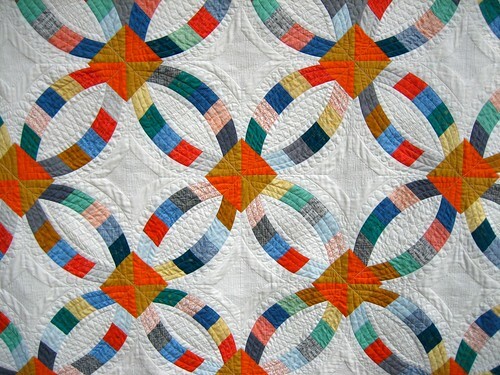 I think this is the best thing I’ve ever made, or at the very least, the best quilting I’ve ever done. The quilting, first stitching in the ditch around the rings with my walking foot and then filling in the FMQ bits took all month, but it was so worth it in the end. 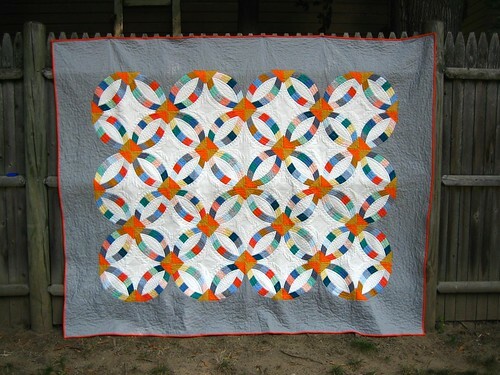 The grey borders are filled with a FMQ stipple, and the quilt is bound in the tangerine Modern Floral from Botanics. I’m so glad this is done; I can’t wait to give it to my friends B&G, who are getting married next month. I’m linking this up with the Sew Kind of Wonderful Quick Curve Ruler linkup. This was also my ALOYF August goal, and I’m linking up there as well! Finishing Metro Rings was one of my Q3 Finish Along goals and it looks like it’s the only one I’m going to complete! Wow, amazing! Big congrats – are you sure you can part with it? It is spectacular! I can’t believe you are giving it away. Any plans to do another for yourself? Gorgeous job! The quilting really makes it!!! WOW! It’s stunning! Love your color choices. This is gorgeous! What an amazing finish! Congratulations! holy moly, that is a big one done, nice job! and a gift no less – wow – i hope they know what a treasure that is! 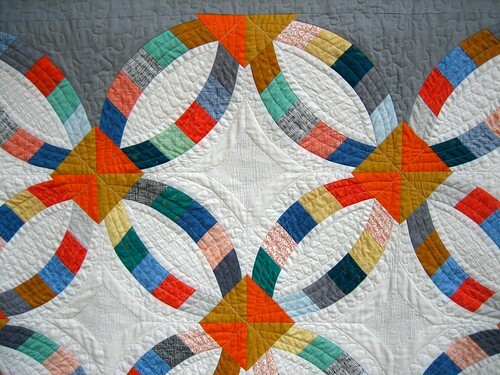 Oh this is wonderful – I just love it and the binding really makes it pop. 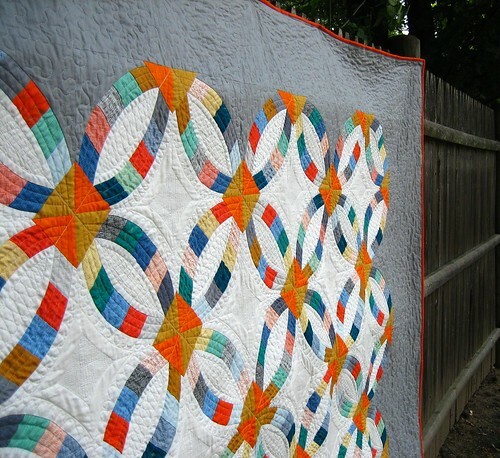 Your quilting is lovely – just really lovely. This is so gorgeous! I love the gray border. It really makes the quilt top design stand out! I love this! 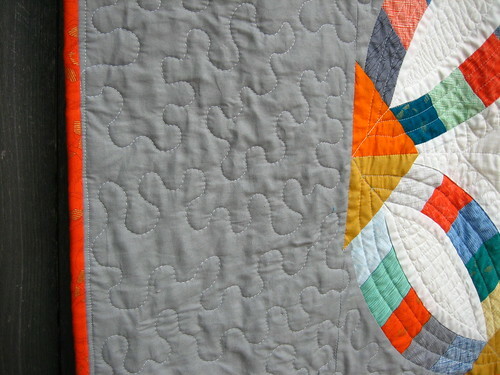 Your quilting looks perfect and the gray border really makes the colors pop. Oh wow, it’s fabulous, congrats on your finish! I shared this on face book. Great looking quilt.